It’s hard to believe I left home exactly a month ago. In a couple days, I will have been here officially for one month! AGH! Even weirder, I was in France 2 months ago. This is just a crazy year of my life. I feel like I haven’t even been able to really process France yet because I haven’t had time. I realized that yesterday, as I was showing pictures and telling some Europe stories to Brynn…and she’s the first person I’ve shown pictures to and told stories to! I didn’t have time while I was home, plus I was mostly with my family and Karl who basically knew what I did while I was in France. I am feeling much better. I started antibiotics the day after my last blog post, and they made me feel better right away. It was hard eating the following few days, and I definitely didn’t want Indian food! Being sick really made me homesick too – I just wanted to be home with the people who love me and with my mom’s food! Indian food is such an adjustment. I don’t hate it, it’s just hard to eat something so different from my normal diet at home and that’s all there is to eat here. Our host mom is a really good cook…but it’s just an adjustment to having rice at every meal and some vegetable mixture and a lot of fish. With the exception of 2 nights ago, I can’t remember the last time I had meat. Last night, Elizabeth made dinner (veggie stir fry) and our host mom said she wants to learn some cooking from us! She says she not very good at making pasta and has never made cookies and wants to learn how to make bread – it’s going to be great teaching her. Of course, she’s going to be teaching us some Bengali cooking in return. She was actually very sweet when I was sick – the day I stayed home I was by myself and feeling very homesick and my roommates were all gone. I was having tea, and Arundhati came home from work and was sitting with me. I started to get a little teary, and she gave me a big hug and took me upstairs with her and we just talked for a few hours. We all had dinner together as a family, and watched a little television. They are a wonderful family, and I feel very fortunate to be living with them and such great roommates. I have barely had any class. Last week, we only had a few classes and then I was sick on Thursday and stayed home. On Friday, we didn’t really have class. Our teacher on Friday is also the vice principal of St. Xavier’s and she was busy preparing for a big festival this past weekend, so she didn’t have class but had us watch a movie instead. We watched the movie Gandhi, which was pretty good. We haven’t had class this week yet, and I’m not entirely sure why we had Monday and Tuesday off but today is a national holiday, Republic Day. 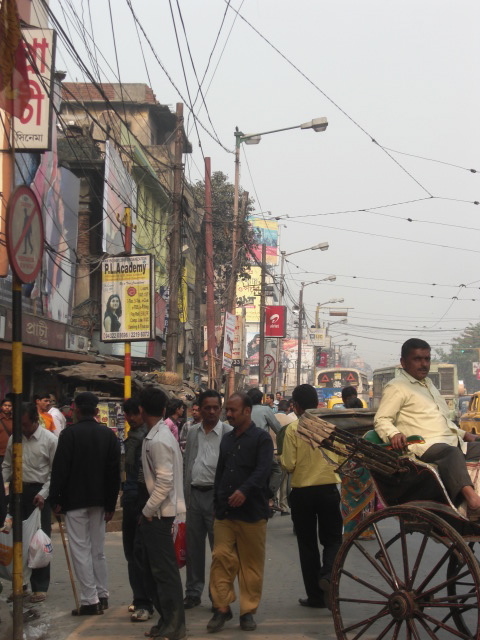 We’ll have class tomorrow, and then Friday we leave for our trip to North Bengal. We’ll be gone until Tuesday, so no class again until Wednesday! After that, I think we will finally have a regular routine of having class…but who knows. Things are so unorganized here, I never what’s going on each day. For example, this weekend we are going to North Bengal and are supposedly going to the Himalayas, but I have no idea where we are going and what we’re doing. Madhu, our director, always has about 8 million things going on in her head so it’s best if we just remain on a need-to-know-basis so she has time to sort everything out. It really seems like we will barely have class here, since we aren’t even actually starting classes until February, and then we will finish classes by about mid/end of April. So that’s about 2.5-3 months of class. It’s nice to have such a relaxing semester, but it would be nice to have a routine here! It makes getting adjusted that much harder. We had an orientation at the place where most of us are going to be volunteering, Loreto Day School. 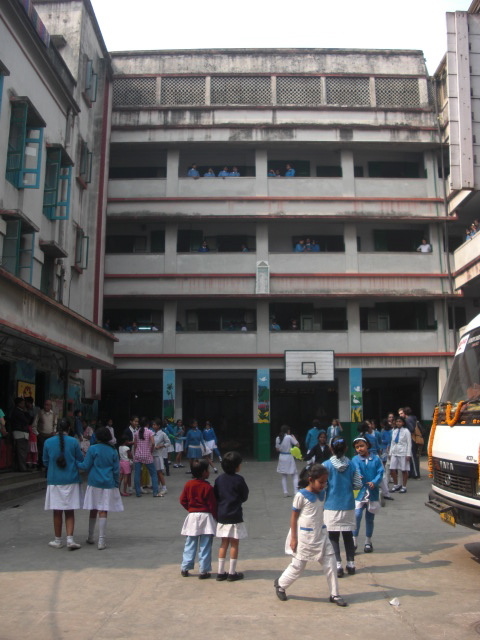 It’s a school here in Kolkata for girls – half of their students are paying students, and the half who do not pay come from very poor families. Another group of students live at the school – they may or may not attend class at the school, but they came from off the streets and live there and they are called the Rainbow kids. This place is so amazing – it has about 20 programs, and it’s run by Sister Cyril, an AMAZING woman. The whole philosophy about the place is amazing – more about solidarity than charity. If they see the need for a program, they don’t wait for the money and logistics to start it, they just do it. They train teachers who don’t have the time or money to attending a teacher training college, they send teachers into the rural areas, the urban slums, the brickfields, and the fishing communities (all communities where children are not really allowed the opportunity to go to school), they lend money to local people to help them with businesses, they search out hidden domestic child labor, they have special ed students, they have a home for elderly people….the list just goes on and on. Sr. Cyril just sees the need for help and just makes so much good out of it, it’s amazing! We are mostly going to be working with the Rainbow kids, so it seems…but since we’re here for so much longer, we will also get to visit some of the other programs like going to the rural villages, going to the brickfields, or helping with the hidden domestic child labor. It’s so great to be able to be a part of this inspiring organization. When we were there, we just had a tour of the place and then sat with the rainbow kids for a while. I sat with a little girl named Priyanka, who was practicing writing English (the normal students come up to help teach/tutor the rainbow kids…more enforcement of the solidarity, not charity). She was very cute, and doesn’t know how old she is. She doesn’t speak much English, but she was so excited to teach me a little Bengali! She was teaching me how to count to 10 in Bengali. I’m not sure how we’re going to fit in there yet, but I hope it will be good. There have been a lot of frustrations lately, and it makes it that much easier to feel homesick. India is just very intense, and it’s full of contradictions and extremes that are hard to understand and process. Being in class is supposed to help us understand India a bit more, but we’ve barely had any class! I’m trying to not be homesick, but it’s a struggle. It’s hard having 2 semesters abroad back-to-back, and I miss campus a lot more this semester. One second I feel like I love it here and am so happy I’m here, and the next second I don’t know how I’m going to survive here for the next 4 months. At times, May feels very close and other times it feels very far away. 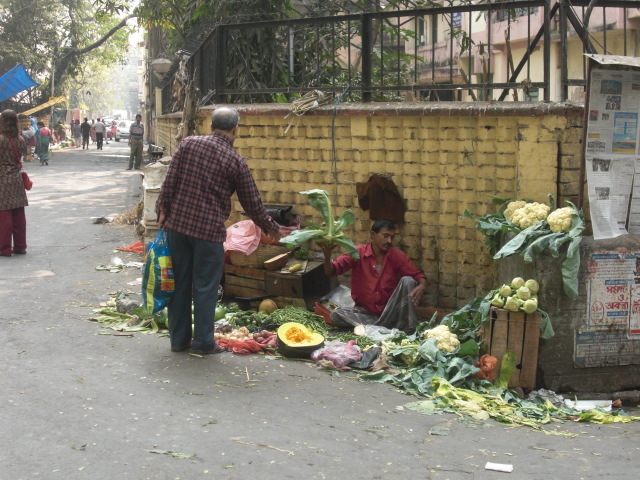 Part of the reason that makes India so hard is that it’s difficult to fulfill basic needs. It’s hard to sleep here, because the mattresses are literally rock hard and there’s tons of noise at all hours of the day; you can’t wash away the stress with a nice long hot shower, because you use a cup and a bucket to bathe; it’s hard to eat, because the diet is so radically different from home and your stomach is freaking out from bacteria and from the spices and doesn’t know how to digest this food that you never eat at home; it’s hard to find bathrooms, and they are rarely ever hygienic in the least; you’re always sick with something, if it’s not stomach upset, it’s something else – I’m congested with a cold now that my stomach troubles are over for the moment. On top of that, safety is a constant concern because we are women, foreign, and don’t speak the language. It’s unsafe to be out past 10pm for sure – 8:30pm is considered late. It’s just such a different atmosphere coming from college and from France when you can be out as late as you want. In France, we would leave at 11pm and come home at 3am. Here you HAVE to be home by 11pm. People always stare at us – we are getting really used to it now, but some of our new Indian friends have commented that people stare at us all the time. It’s just something you get used to, and you get used to them taking pictures of you too. Most people (men our age and little kids usually) will say “hello ma’am how are you?” about 10 times in a row since that’s the only English they know. It is a bit draining to have to be constantly on your guard about your safety – especially around men, and even more so at night. You also have to be really assertive with cab drivers. 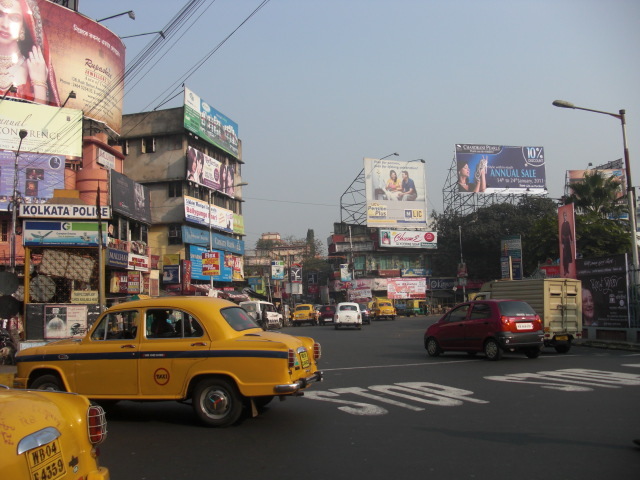 Kolkata is NOT easy to navigate, which is another hard thing to get used to. We can confidently go to school/the street our school is on and back, and a few other places like the mall and other places near our house, but other than that we need specific directions. It’s so hard here because the streets are not at all a grid, and they have 2 names – a newer Indian name and an older British name – and some streets are known better by one name more than the other, and some maps only have one name or the other, and on top of that the one-ways change directions at certain times of the day. Sometimes cabs will offer us a ridiculous price and refuse to turn on the meter, other times the cab drivers just refuse to pick up people. I still haven’t taken the metro yet, but my roommates have. One day we were going to take the metro but couldn’t because we literally couldn’t fit another body into the car. It’s also hard to constantly be spending money. It was like that in France too, and certainly more expensive than here, but I didn’t have to spend money on the weekdays in France. During the week, I lived/ate/went to classes in the same place; weekdays are where I spent my money traveling and everything and managed a pretty good budget. Here, things are cheap – Rs 200 is $5, and you can get a lot of things for Rs 200 depending on what you’re buying. The only problem is when everything is “only $5” you end up spending so much more because it’s “only $5″…but then each $5 you spend, it adds up really quickly. Here we have to spend money on transportation a lot – if we ever want to go someplace, you have to pay to get there, spend money wherever you are, and then pay to get back. Since things are so cheap here, I need to start making a better budget. 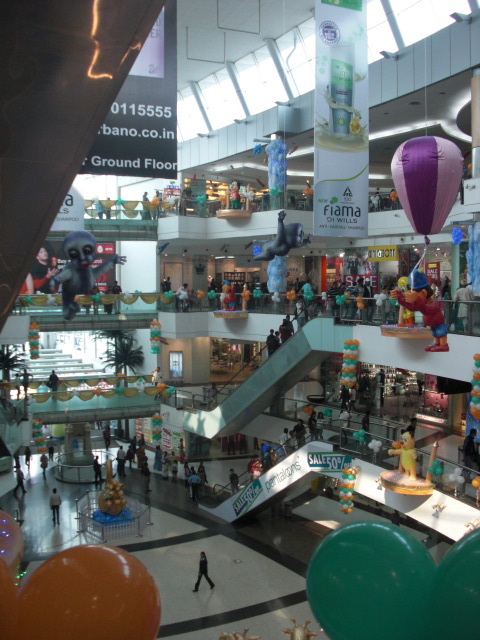 It’s also hard deciding on entertainment outside of the house because it takes a long time to get anywhere because of traffic and because Kolkata is so spread out. 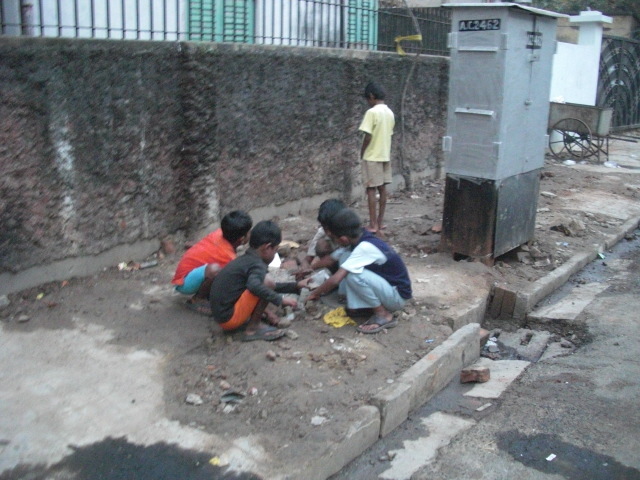 It takes 45 minutes to visit our friends who live in Salt Lake, a residential area of North Kolkata. Sometimes we can’t go out because it wouldn’t be worth it by the time we get there. I feel like I’ve been sitting at home a lot lately (doesn’t help that I was sick for a few days last week) but a lot of times it just doesn’t feel like it’s worth the hassle of going out, and we have to really plan ahead to go out because we have to be back so early. It is getting better though because we’re starting to make Indian friends! We haven’t met very many yet because we haven’t had a lot of class time, but I met a girl in class named Satakshi. I talked to her one day in class, where she gave me her phone number and was super nice. I didn’t get to sit next to her the next day, and we weren’t in touch at all until yesterday. I was at the mall with Elizabeth, and she saw me there and we talked for a little bit, and later that day I got a text from her inviting us out to lunch and a movie today! It was great, and she brought along another girl from our class, Raddhima. Students are really nice here, and it’s like instant friendship. You can talk to them one day in class and they will give you their number right away and say, “Call me if you need anything, and I’ll show you around”…and the best part is they actually mean it! Satakshi and Raddhima are already planning on taking us to all these other places. People are so welcoming and so nice here, which is great. It’s really nice to be with students who can show us around and who speak the language! 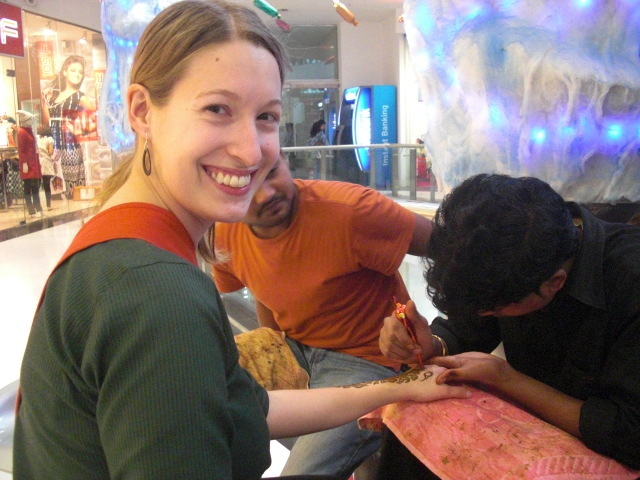 When I was at the mall the other day, I got some mehndi! 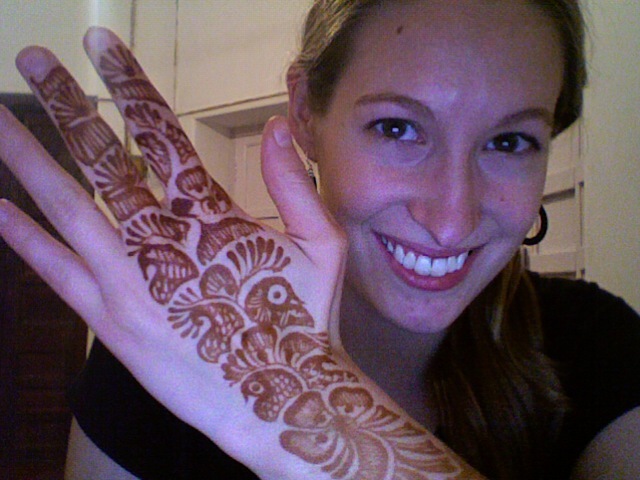 We call it henna at home, but here henna means something different. Apparently the mall is the place to get it done. They have several people there, and you pick the design you want. Mehndi is from ground henna leaves, which you apply to the skin and it dyes your skin. At the mall, the artists use a paper funnel with a very fine tip to apply it – and it reminded me of icing a cake. The artists are very talented, and very quick! My design only took about 3 or 4 minutes. Once it’s applied, you have to let it dry for about 15 minutes. Then you have to wait 2 hours before you can scrape the dried mehndi off your skin. After that, your skin is dyed. You can’t touch water for 5-6 hours, and the color darkens over the next 12 hours. The dye lasts for about 10 days to 2 weeks and slowly fades. Here, it’s traditional for Hindu brides to have their hands and feet decorated with mehndi for their wedding – and they say the darker the mendhi appears on your skin, the more your husband loves you. Now it’s not only for brides – anyone can get it done! I plan to have it done a few more times – and go all out the last time and get both sides of my hands done. 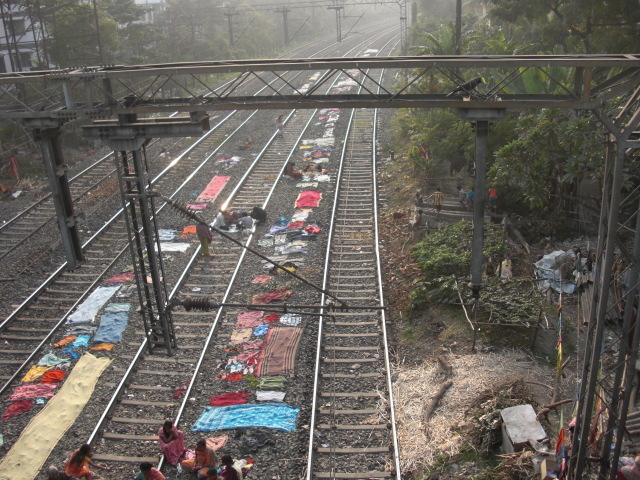 Other than that, I’m still writing for the Lost Girls and my first India piece is posted! Check it out: 8 Things You Should Know Before You Go to India. I’ve also decided to start contributing to another travel website, called Pink Pangea. I think I will have more time for writing here, and there is so much I could write about – the only hard thing is trying to describe everything! It’s so hard to put this experience into words, and I’m starting to realize that I have learned a lot more already than I think I have. At the same time, I feel like the more I learn, the less I know. Hi Katie! Since I love reading the LGs so I got to your site. I’m always looking for people who goes to, not just India but WBengal!! 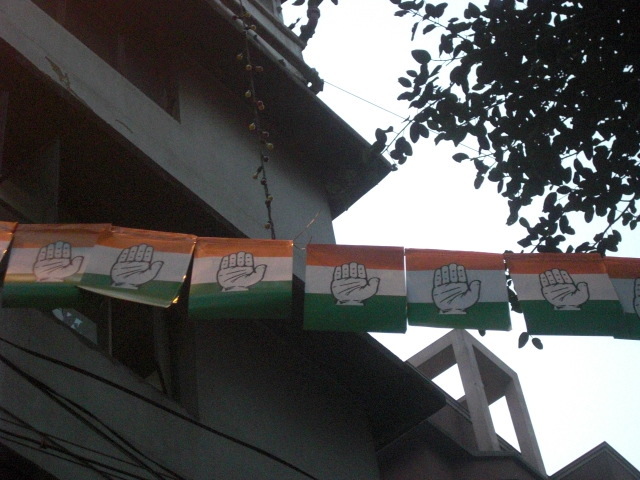 As that’s where I used to lived in Siliguri 3 hrs from Darjeeling. I can’t wait to read about your time in India, yay!!! Have great time!